This weekend, Jagmeet Singh, the newly elected leader of Canada's NDP, posted a short video to his Instagram page with a friend. "Canada's #1 Author with Canada's next Prime Minister. Game recognize game and we looking real familiar," he wrote. It's hard to say who is more in demand right now. 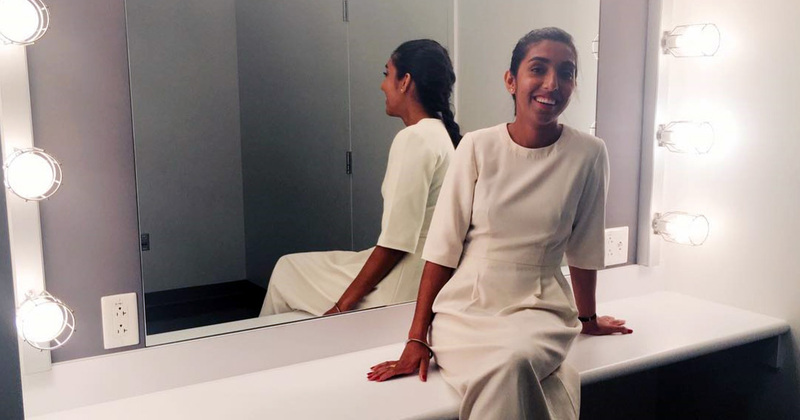 Rupi Kaur isn't just Canada's top author, she is on track to be one of the best-selling authors in the world. "Her voice is resonating around the world like no other Canadian author we've ever seen before," Kevin Hanson, president of Simon & Schuster Canada, told the Globe and Mail recently. "I don't think there's a Canadian author who's seen this kind of response, globally, like this, at such a young age." Even though Simon & Schuster Canada is publishing her new book, he is not exaggerating. Rupi Kaur's first book, Milk and Honey, is still selling around 30,000 copies a week, more than most poetry writers sell in a year. It has sold 2.5 million copies worldwide and spent 77 weeks on the New York Times Paperback Bestseller List. It even hit the #1 spot on January 15, 2017. Let's rewind a bit here and start at the beginning. Born in 1992 in Punjab, India, her parents emigrated to Canada when she was three years old. Brampton, which lies in the Great Toronto Area, is well known for its large population of Canadian Sikh families. Three years Rupi Kaur was a student at the English department at the University of Waterloo. She posted and shared her writing and poems largely online, first Tumblr and then Instagram. In November 2014 Rupi Kaur self-published Milk and Honey, which eventually ended up selling over 15,000 copies before being acquired by a traditional publisher. It was re-released in October 2015. Her breakout moment came in early 2015 when Instagram deleted her picture of her lying on a bed showing menstrual blood. She posted a note in defiance at Instagram's censorship and accused it of double-standards. "i will not apologize for not feeding the ego and pride of misogynist society that will have my body in an underwear but not be okay with a small leak. when your pages are filled with countless photos/accounts where women (so many who are underage) are objectified," she wrote. Her note and the picture went viral, forcing Instagram to restore the original post and propelling her to global fame. The controversy helped her reach a wider audience but it wasn't the sole reason for her success. Her publishers admit that sales for Milk and Honey were initially slow, picking up only in early 2016. They didn't reach their peak until a year later. As her fame grew, so did the parodies and criticism. Some say her work is too superficial or too narrow, only touching on themes such as love, loss and relationships. Other simply say its too formulaic. One critic wrote that her "use of unspecified collective trauma in her quest to depict the quintessential South Asian female experience feels disingenuous." But she also has her defenders. A fan told the New York Times: "Her poems are important to South Asian women like me. She’s breaking into this industry that doesn’t represent people who look like her — who look like me." Matthew Hart, a professor of English and comparative literature Columbia University told the paper: "Critics might think that Kaur’s readership is young and female, so her work can’t be serious, which is obviously wrong. Her style doesn’t seem naïve." She is also one of her own biggest critics, telling the Globe and Mail: "Sometimes I'll read certain pieces and I'm like, 'That's so embarrassing I wrote that. It needs to be edited like 500,000 times.'" The debate hasn't hurt her book sales however. At the times of writing, Rupi Kaur's second book The Sun and Her Flowers, out this week, is No. #2 on Amazon's worldwide bestseller list. Ms Kaur will spend the next six months touring the world to promote it. Her fans can't get enough. One wrote on her Instagram: "i’m absolutely in love with your books! i wish you knew how much they changed me into the person i am today! thank you 💕"